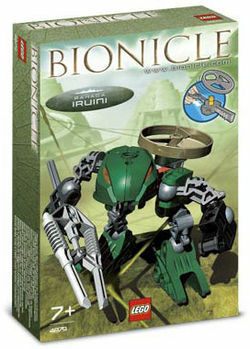 4879 Rahaga Iruini is a BIONICLE set released in 2005. It comes with a gold Rhotuka Spinner, a Rhotuka Launcher, Iruini himself, and his staff. He was one of the six Rahaga released. He was originally a Toa Hagah. A set of his Toa form was released. In BIONICLE: Web of Shadows Iruini talks in clicks and seems to have trouble landing too. This is a description taken from LEGO.com. Please do not modify it. (see an archive of the product's page) Trapper of dangerous creatures! Nimble and athletic, Iruinj is the best there is at trapping Rahi who hide atop the towers of Metru Nui. His snag spinner tangles the legs of creatures, cutting off their escape. Add #4878 and #4877 to build a Visorak colony drone! His head and weapon are the same as those of the Rahkshi Lerahk. Facts about "4879 Rahaga Iruini"